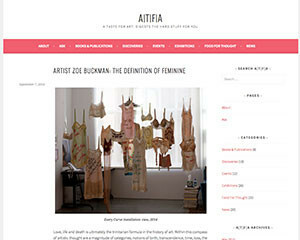 ATFA or A Taste for Art recently digested the hard art stuff in Zoe’s contemporary artwork, Every Curve and posted an incredible article discussing the feminine and masculine aspects of the work, its provocative questions and representation of feminity. Love, life and death is ultimately the trinitarian formula in the history of art. Within this compass of artistic thought are a magnitude of categories; notions of birth, transcendence, time, loss, the masculine and the feminine. Household names closely associated with the latter category are Tracey Emin, Sophie Calle, Louise Bourgeois and Cindy Sherman, all who in varied ways address questions concerning the role and representation of women in the media and society at large, respectively. The ever-changing subject of the feminine in artistic practices has largely superseded traditional feminism and essentialist notions of the female, discarding concrete resolutions in favour of provocative questions and ongoing conversation. Zoe Buckman is one such progressive artist within this ilk who questions the category of ‘woman’ with acute verisimilitude. Her ongoing series Every Curve forcibly unites the apparent contradictions between ‘the masculine’ and ‘the feminine’ in contemporary culture by sewing directly onto vintage lingerie pieces lyrical segments of the infamous wrappers Tupac and The Notorious B.I.G.